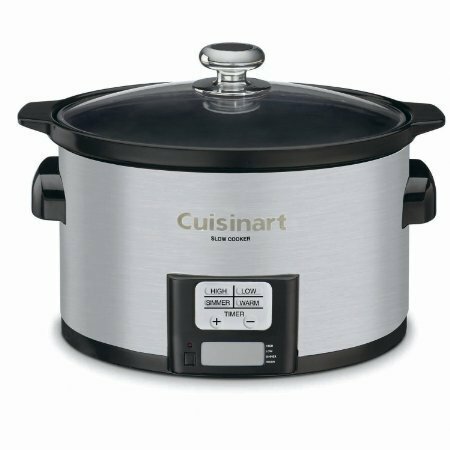 The Cuisinart Programmable 3.5-Quart Slow Cooker perfects it using a precise, convenient 24-hour LCD countdown timer and four cooking modes, including a Warm function when the time elapses. Dimensions: Measures 14.2 in. x 16.5 in. x 11.8 in. A Closer Look: It's easy to make comfort foods or try out new gourmet creations -- all in a convenient-sized ceramic pot that fits comfortably on any countertop. Take Care: Dishwasher-safe pot and lid. About the Brand: When the food processor was introduced in 1973, it wasn't known as a food processor; it was commonly referred to as a Cuisinart. The rest is culinary history.